Prices include local taxes. Accommodation prices include breakfast. Prices are subject to change according to changes inyour arrival/departure daysand added goods and services. 29-0 days before reservationstart, 0% of reservation total will be charged in case of cancellation orchanges to reservation. Allergies and rooming list are tobe provided latest 14 days before reservation start. All minors shall be accompanied by a supervising adult. Children shall notbe left unsupervised.Please contact us if cribs or other child-related servicesare needed. Outdoor parking is available for guests. Kuerkievari Kuerhotel Kuerhostel Oy gathers information on their guests toimprove customer experiences. Personal information is not distributed outsidethe company.Please let us know if you do not wish to receive newsletters. If Kuerkievari Kuerhotel Kuerhostel Oy is not able to providefor confirmed accommodation,the Company will arrange for alternativeaccommodation in the region and notify the Guest as soon as possible.If alternative accommodation is notavailable, the Company will refundthe reservation costs. Possible additional or third party costsare not refunded. In case of any shortcoming or complaints, the Guest shall immediatelynotify the Company so the mistake can be rectified. Complaints madeafterCheck-out will not be refunded. Guests are required to treat the accommodation and other guests withrespect. Damages to property will beinvoiced from the person responsible, orfinally for the person who has madethe reservation. The Company is notresponsible for lost or damages items during your stay, please take care ofyour belongings. 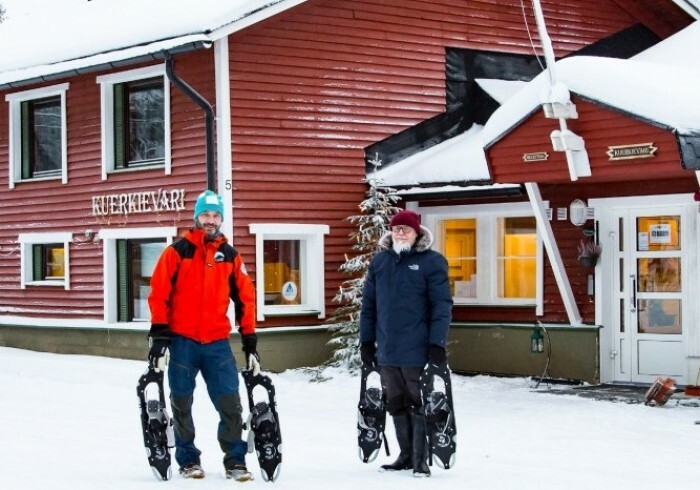 Kuerkievari KuerHostel is a family-owned and intimate hostel situated beside the spectacular Kuer Fell, only 2 kilometers from Äkäslompolo village, Ylläs. Situted by the Kuer Fell KuerHostels surroundings offers great experiences whether by skiing, snow shoeing, snow mobiling, hiking or even biking. By nightfall, take a look at the sky to marvel at beautiful Aurora Borealis. Your adventure starts on our doorstep! KuerHostel - the less expensive Lapland experience.